I have all sorts of things I'm loving right now. My baby girl asleep on my lap is one of them. The fact that she is there because she is so congested she sleeps better upright, not so much. Our new desktop computer is another one. The fact that we finally bought it because our old desktop died a few years ago (yes, you read that right, years) and STILL has a number of photos on it from the first year of The Princess's life on it that were never backed up, not so much. My back is much, much better is is yet another thing I love. The fact that last Thursday was the last time I ran, not so much. Have you figured out my upcoming giveaway yet?? 1. I hope the little one gets to feeling better!!!! :( Poor thing. My littlest girl kept falling asleep in my lap when my husband was out of town and she was sickly. It made me simultaneously full of sadness for her sickness, and warm fuzzies that I got to enjoy snuggling her while she slept. I hope your little one is better very soon! We had snow this morning but it's gone now. Those arm sleeves are really cool! Hmmmmmmmm? What could it be? Funny enough I haven't run in a week either. Dislike. I'll be staying tuned in for the giveaway! Those sleeves are begging for a 15K. It helps that your back is cooperating. Because computers are so much fun, if you want help recovering those pictures, say the word. First year pictures are too much fun. Dozens of consecutive shots just to capture a single toothless smile. Priceless. Hopefully you can get out there and use those sleeves! Hey cuz I want some of those toooooooooo. May I say I hope that is your giveaway and I get a chance. Thanks for keeping me inspired on days I want to cough up a lung. We have had those sickies here too and I want it to be gone. 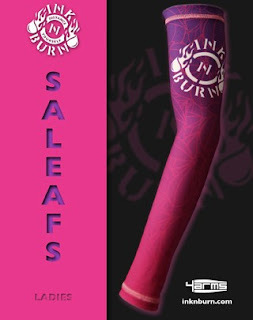 Those are some HOT arm sleeves! I bet you'd go faster just wearing those! I'm glad your back is feeling better! That really stinks not having a good reason for it to hurt. Good luck on your race tomorrow! At least it will be a running day! CUTE! Love those!! :0) Hope you have a great weekend! Hope your daughter feels better! Have a good weekend! I LOVE the cute pink plaid "Britney" 4arms!! Checked them out and it would have to be the PINK ones!